The Redhawks' 14th consecutive victory this season may have been their biggest yet, as they toppled the top-ranked team in Class 3A on the road. You could’ve gotten a ticket for $6 to see Minnehaha Academy take on DeLaSalle on Saturday night, but you had to get there early. Dozens of fans waited outside the front entrance of DeLaSalle High School before the girls’ game that preceded this heavyweight matchup was even at halftime. Once that contest ended, the gym filled quickly, and once each team had players throwing down warm-up dunks, it was clear that this was not going to be your normal high school basketball game. Suggs and the Redhawks, who are ranked No. 1 in Class 2A by Minnesota Basketball News, were able to handle the crazy environment and come away with a 79-71 victory over the No. 1-3A Islanders, extending their winning streak to 14 games. 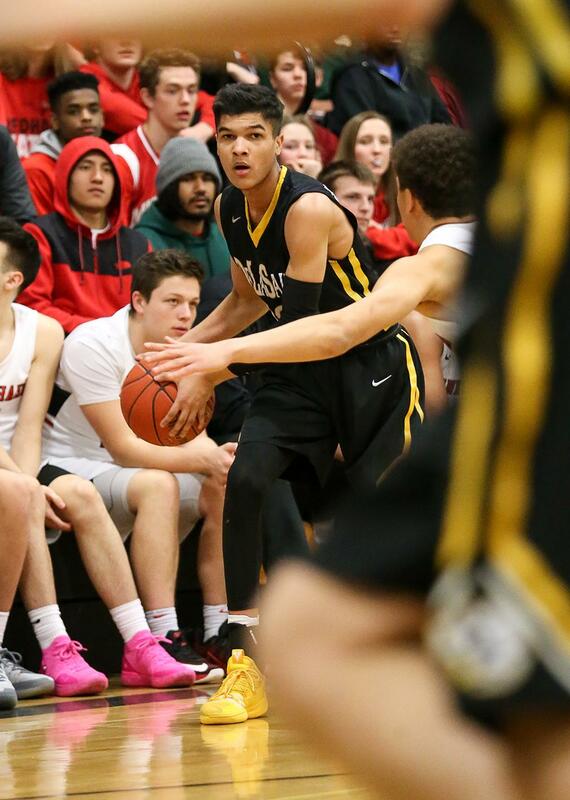 DeLaSalle had a 42-38 lead at halftime, but the Redhawks (20-4, 4-0) went on a 12-3 run to take a 59-57 lead with 8 minutes, 54 seconds remaining in the second half. From there, the Redhawks took over, and built an eight-point lead with less than five minutes left on the game clock. Suggs fed off the energy of the crowd to score a game-high 30 points, while accumulating six rebounds, nine assists, a block and a steal. Chet Holgrem, a 7-foot sophomore, was also impressive for the Redhawks. He tallied 15 points, and teammate Prince Aligbe, a 6-foot-5 freshman, added 13. Suggs is getting used to hype and attention, as he had a dunk go viral from the Redhawks’ 63-59 victory over No. 2-2A Minneapolis North earlier this week. And any scouts watching Saturday must have been pleased with the sight of Suggs, as the spotlight clearly didn’t faze him. Minnehaha Academy coach Lance Johnson has gotten used to seeing Suggs perform at a high level for five years now, so while the atmosphere on Nicollet Island was something different, the performance from his star player was nothing new. “Since he’s been in seventh grade, he doesn’t back down and he usually plays his best when the opponent is really good; He didn’t surprise me,” Johnson said. This was one of those games where the final result felt like it took a back seat to the showcase of the game itself. 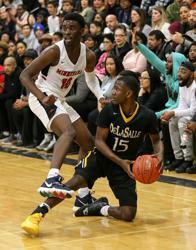 While the Islanders (19-5, 7-0) may not agree with that sentiment, the matchup featured a lot of talent, especially when factoring Suggs in with DeLaSalle’s pair of Minnesota Mr. Basketball semifinalists, Tyrell Terry and Jamison Battle, who combined for 48 points against the Redhawks. The scoreboard indicates otherwise, but from a spectator’s perspective, it’s hard to pick out a loser from this matchup, especially with section playoffs looming. This was the kind of contest that seasons teams and their stars, helping propel them into the postseason. 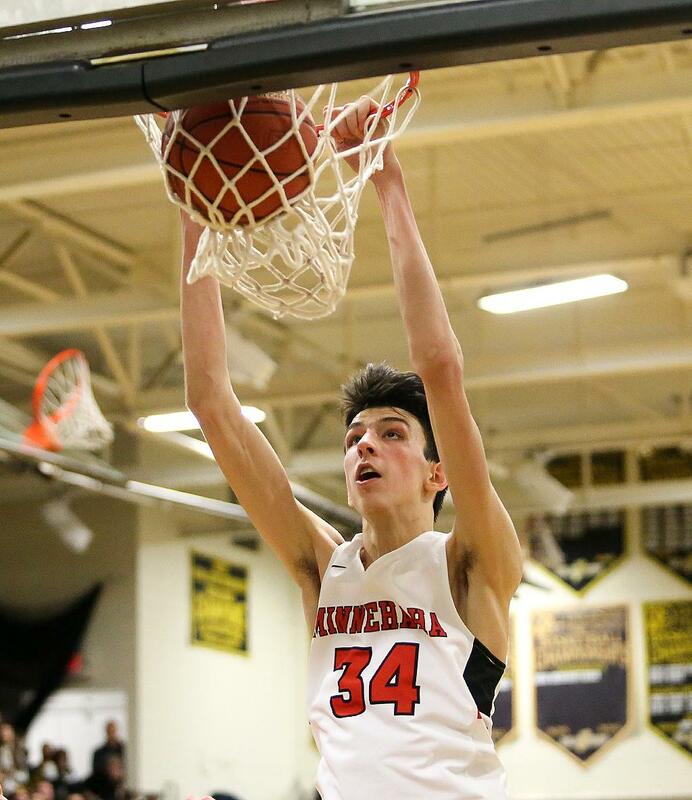 A sold-out crowd at DeLaSalle High School witnessed arguably the biggest matchup in Minnesota boys’ basketball this regular season on Saturday night, as Minnehaha Academy, ranked No. 1 in Class 2A by Minnesota Basketball News, defeated No. 1-3A DeLaSalle 79-71. The Islanders, who feature two Minnesota Mr. Basketball semifinalists in Tyrell Terry and Jamison Battle, led 42-38 going into halftime. They stayed ahead on the scoreboard early in the second half, until the Redhawks (20-2, 4-0) went on a 12-3 run to take a 59-57 lead with 8 minutes, 54 seconds remaining in the second half. Minnehaha Academy continued to expand its lead, going up by eight points with less than five minutes remaining. 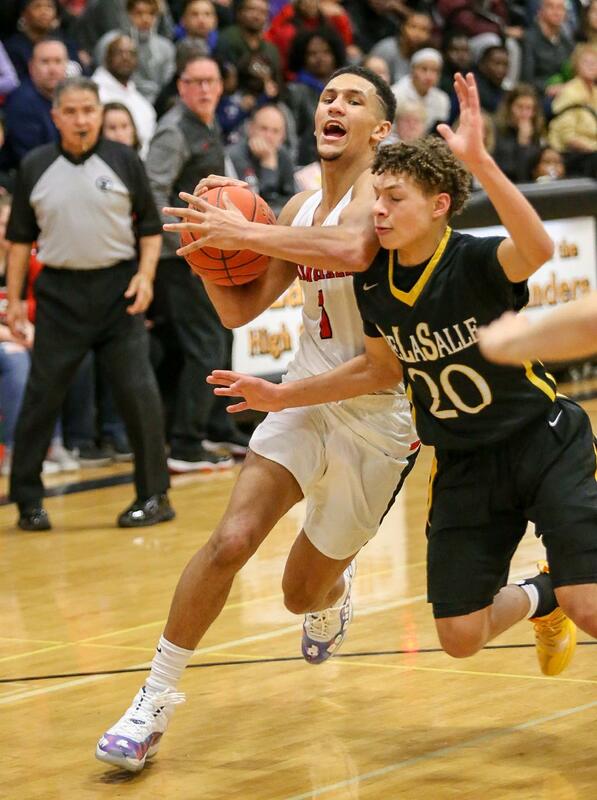 The Redhawks’ Jalen Suggs, one of the nation’s top collegiate recruits who’s averaging 24.4 points per game as a junior, led all scorers with 30 points and added six rebounds, nine assists, a block and a steal. Terry paced the Islanders (19-5, 7-0) with 26 points and added four rebounds, five assists and three steals, while Battle contributed 22 points, eight rebounds, three assists and a block. This was the 14th straight win for the Redhawks, and DeLaSalle is the second ranked opponent they beat this week, as they took down No. 2-2A Minneapolis North 63-59 on Tuesday.